Reporter: Estate living is not only a sought after way of living, but has become quite popular and it generally comes with a lot of safety. 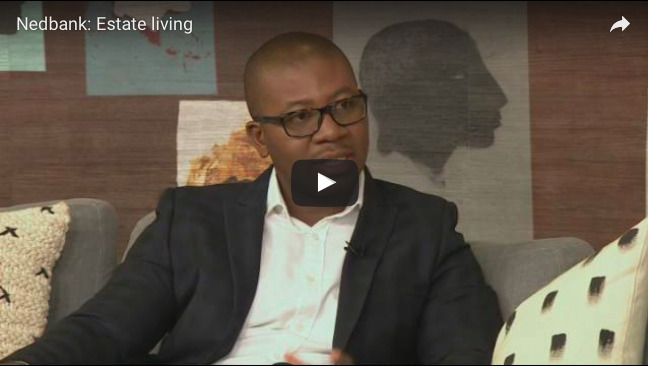 We have Tim Akinnusi with us in the loft, who's the head of sales and client value management at Nedbank home loans, to help guide us through buying into estate living. Welcome back, Tim. So estate living has become quite appealing, why is that? Yes, I think over the last 10 to 15 years, you've seen a lot more developers build homes in a clustered fashion. So as a result of that, it's become very appealing for new entrants into the market. So a lot of people would choose a home in an estate as a their secondary or primary home, is this financial or is it more lifestyle choice? I think it's both, from a financial standpoint, being able to buy into an estate - especially a brand new one - you get to be spared the cost of transfer costs and registration costs. So it's a bundle option, that people would then buy into. From a lifestyle standpoint, you're finding more and more entrants into the home loan or housing market in essence would be choosing estate living then, as the preferred option to go into. And one of the benefits of living in an estate is feeling like you're part of a community, and I'm sure among many other benefits. What are some of the challenges of living in an estate? So there are some pros and cons with it. And I think from the challenges side of it, I would say that being in an estate, you need to contend with the fact that you are in a community and you're part of a community. So a lot of the times, you are not very flexible in terms of how you want to design your house, because it's all part of a uniform approach to doing things. You'd also be subjected to levy costs that have been set by the body corporate, which you as a homeowner would be part of. So again, that's an added cost that you would need to factor into your monthly expenses. Thirdly, there are a lot more rules that you need to abide by, because you're now part of a community. So a lot less of an opportunity to kind of set your own standards etc. So, Tim, as a bank, do you have a bias towards estate living or standalone homes? That's a good question, Bonnie. We absolutely don't have a bias. If you choose to buy in an estate or in a standalone environment, we would be proud to finance your home, provided that the valuations are correct in terms of the value of the place, and that you can afford it. So the question of whether or not you want to live in a standalone or an estate, is really down to your individual personal preference in terms of the things that are important to you as a homeowner.